By Caitriona McKenna | September 28, 2010. The Plough and the Stars by Sean O’Casey returned to Dublin’s Abbey Theatre from 21 July to 25 September, and having enjoyed studying the iconic Irish play for the Leaving Certificate, I was thrilled to get reacquainted with the masterpiece in its original surroundings. During its debut in the Abbey Theatre in 1926 it was considered to be an extremely controversial play, causing riots due to the appearance of a prostitute onstage in the character of Rosie Redmond, the presence of an Irish flag in a public house and the use of the words of Padraic Pearse, all of which caused upset and was considered disrespectful towards the ideals of the men of 1916. However, despite the play’s controversial past, its brilliance was in no way undermined in this latest revival from director Wayne Jordan, which received warm reception from the masses. 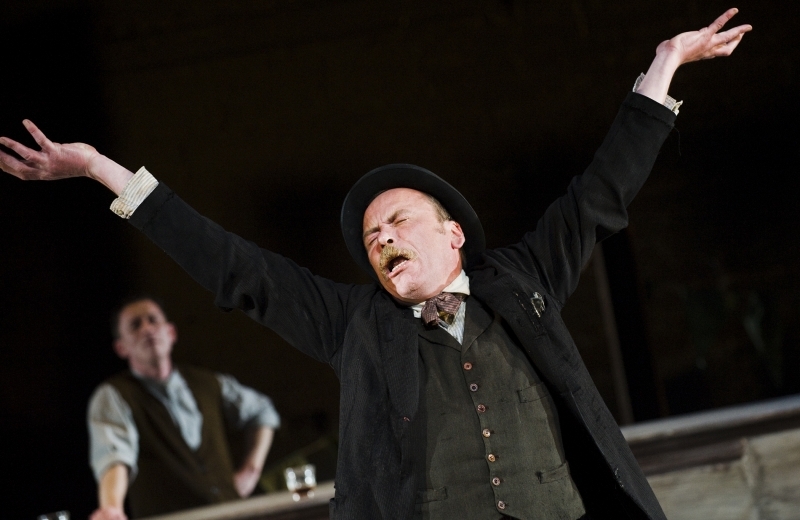 O’Casey flawlessly weaves comedy with tragedy in this play, set against the backdrop of the 1916 Rising, with an assortment of ordinary yet unforgettable characters living together in a tenement house in Dublin City trying to overcome the difficulties in their lives in a period of political upheaval. The characters were portrayed by actors who delivered stellar performances and should be praised not only for their roles alone, but for their perfect adaptations of the ‘aul Dub’ language which was essential to the play, from Mrs Gogan’s ‘Excuse me!’s to Fluther’s continuous ‘derogatory’ remarks, never failing to bring their characters to life in such a way that would make O’Casey proud. 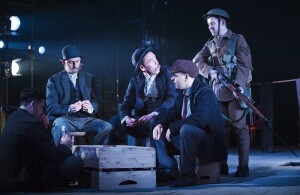 Dara Devaney, Frankie McCafferty, Joe Hanley, Laurence Kinlan and Ciaran O'Brien in THE PLOUGH AND THE STARS by Sean O’Casey, directed by Wayne Jordan, on the Abbey stage 2010. Pic by Ros Kavanagh. Among the main characters are Jack and Nora Clitheroe, played by Barry Ward and Denise Gough, a young married couple who are torn apart by the Rising and Jack’s decision to choose his duty to his country over his wife. Although Ward did not portray Mr Clitheroe as I imagined, he managed to achieve the characters headstrong nature, and any other areas in which he lacked were definitely pulled up by the outstanding performance of Denise Gough. Gough succeeded in portraying Nora in such a way that you could really feel for the character through all of her anguish of wanting a better life for her and her husband and even more so during her breakdown following his rejection. The very memorable Fluther Good, played by Joe Hanley, without a doubt stole the show with his excellent timing, comedic attitude, perfect deliverance of his wonderful lines and his physical manner which was not only highlighted by his characters wonderful energy, but also during his hilarious confrontations with the character of Peter Flynn, who was exceptionally played by Frankie McCafferty. Excellent performances were also given by Laurence Kinlan as the Young Covey, Cathy Belton as Mrs Gogan, and Gabrielle Reidy as the admirable Bessie Burgess, as well as the small character of The Woman from Rathmines played by Natalie Radmall-Quirke, who impressively managed to make her character humorously memorable. Recognition must also be given to the wonderful costume and set design as well as the antique props used in the play (the baby carriage for one received many remarks of praise). Not only were the costumes stunning but I found myself thinking that they seemed so perfect that they could be mistaken for actual vintage finds rather than tailored specifically for the show, definitely giving you the feel of the era in which the play is set. In conclusion, The Plough and the Stars is definitely O’Casey’s greatest work and provides a different and unique view to life during the 1916 Rising by giving it an aspect of humanity through lovable and real characters. O’Casey gives us historical information on what happened during the Rising while presenting it in a way that is unknowingly absorbed through the storyline. 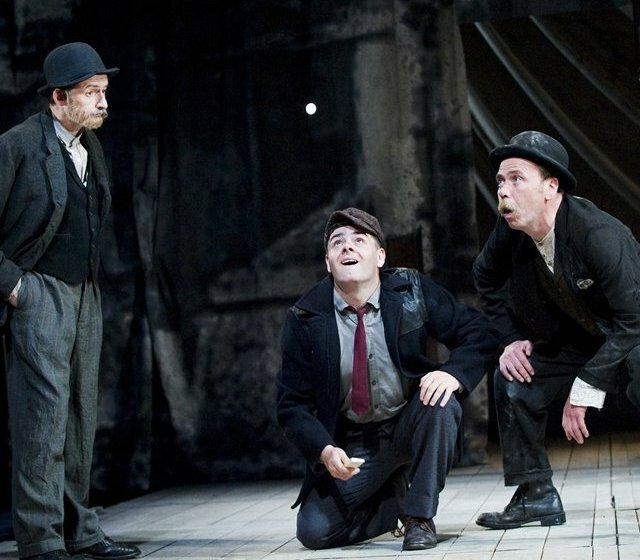 Along with the excellent performances from an exceptional cast and brilliant direction from Wayne Jordan, this was a wonderful production that not only remained true to the text and O’Casey’s attention to detail but also to the spirit in which it was written.